Nitrogen (N) (atomic number 7 and atomic weight 14.008) has density of 1.25 gm/litre at standard temperature and pressure. 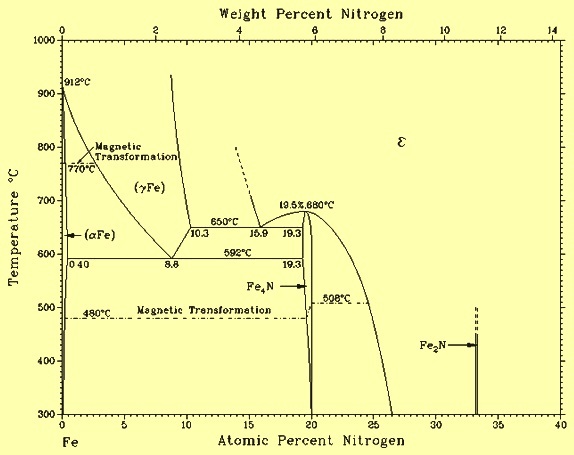 Melting point of N is -210 deg C and boiling point is -195.8 deg C. The phase diagram of the Fe-N binary system is at Fig 1. N is present in all commercial steels. Since the of concerns of presence of N in steels are normally small and its analysis being complex and expensive, its existence is generally ignored even in steel specifications in various standards. However, whether present as a residual element or added deliberately as an alloying element, the effects of N in steel are significant. N is an important and inexpensive alloying addition to steels. In recent years there has been an increasing demand to reduce and control the amount of dissolved gases in steel. N is one of the important gas which when dissolved in liquid steel affect its properties significantly. Hence control of N content of steels during steelmaking is important. N in steel can be in its uncombined form as free N or in the form of a compound or nitride. Steel from an electric arc furnace (EAF) normally has higher N levels (70-110 ppm) compared to that produced in a basic oxygen furnace (BOF) where N varies between 30 and 70 ppm. Hence, N is of particular importance in an EAF plant. In certain stainless steel grades the amount of N can be at the level of 3000 ppm. N levels in degassed steels can be below 10 ppm. N exists in steel as an interstitial quite similar to, but much more soluble than, carbon (C) and as nitrides of iron (Fe), aluminum (Al), vanadium (V), niobium (Nb), titanium (Ti), and a number of other alloying elements. N can be either harmful or beneficial to the properties of steel, depending on the form in which it is present in the steel. However, the behaviour of N in the steel can vary from that of an occasional nuisance to a safely controlled, useful alloying addition. Sources of N during steelmaking are raw materials such as hot metal, scrap and coke, the impurity of N in oxygen (O) gas, and N used as a stirring gas. During steelmaking, N can be present in steel as a constituent, intentional or otherwise, through ferro alloys, and it can enter by ordinary solution through contact of the liquid steel with air (during reblows and during tapping). N can also be diffused into the surface of steels to give an extremely hard case. In case of N being used as a deliberate alloying element in steels, N is added to liquid steel in the form of nitrogen bearing alloying additions or as gaseous nitrogen itself. Nitrogenous alloying agents include nitrided ferromanganese, nitrided ferrochrome, a V-N compound, nitrided metallic manganese(Mn) and, less frequently, calcium cyanamid and urea compounds (the last two compounds react violently with steel giving severe fuming and splashing). Nitrided ferromanganese contains normally 4 % to 6 % N. These addition agents are used in the production of N enriched stainless steels as well as for grain size control in high chromium (Cr) cast irons. V – N compounds are used in the production of HSLA (high strength low alloy) steels and other V alloyed steel grades. Addition of N, beyond that already present from the steelmaking operation, is not normally necessary, but where additional nitrogen is required, it is usually based on a nitrogen bearing ferroalloy. Thus Mn or V and N trim additions can be made in the ladle. Two important factors to consider are the temperature and the overall composition of the heat. Temperature is important since it determines the solubility of N in liquid steel; the higher the temperature the higher the solubility of the N gas. Control of composition is important in that elements such as Al, Ti, zirconium (Zr) and the rare earths form very stable nitrides and, while these may be useful, they can tie up N intended for other purposes. Titanium nitride (TN), for example, is so stable that it begins to form before the steel solidifies. TN can be used to produce improved properties, but removal of N from solution before solidification reduces the amount of N available, for example, for solid solution strengthening or for formation of other nitrides or carbonitrides during controlled rolling. Vanadium nitride (VN) precipitates below the melting point of steel. This latter fact is thought to contribute to the sometimes erratic recoveries experienced when using a nitrided vanadium type addition agent. The agent must first dissociate, giving up its N to the melt, only to reprecipitate VN during subsequent processing. N addition agents are usually added in stages, with adequate stirring, to ensure a uniform concentration throughout the ladle and avoid exceeding the solubility of liquid steel for N in localized areas. The aim is to avoid supersaturating the liquid steel in stagnant areas. If nitride-forming elements are to be added in excess of the stoichiometric amounts, they are normally added before the N addition agent itself. This increases the solubility of the N addition and thereby improve its recovery. N can also be added by bubbling the gas through liquid alloy steel prior to teeming but only if sufficient nitride formers or fixers are present. This is commonly done in the AOD. N bubbling can only be performed successfully after oxidation is complete because the evolution of CO bubbles during oxidation will flush dissolved N out of the liquid steel. Removal of N from the liquid steel is normally done by regular degassing. Vacuum degassing is not very effective in the case of N where removal is normally less than 20 %. High sulphur (S) contents and heavy slags can make N removal difficult. During most ladle treatments there is a significant N pickup from the atmosphere. Other ways to reduce the N in the liquid steel have been tried. Possibilities of removing N by using the slag have also been explored and it depends a lot on the nitride capacity of slags. However, slags cannot remove significant amounts of N economically. It is generally thought that the slag insulates the liquid steel surface from the atmosphere. However, N transfer from the atmosphere through the slag layer may result in a significant N pickup in the liquid steel. Since it is not possible to remove N without vacuum degassing, the pickup of these elements in the ladle and casting operations must be minimized. The rolling and hot working of N bearing steels is based on the complex solubility relationships of N and the many alloy nitrides. These relationships are analogous, but different from, the corresponding relationships for C and alloy carbides. The situation is rather more complex by the fact that alloy carbides and nitrides are usually isomorphous with a high degree of mutual solubility for C and N, normally known as carbonitrides of variable composition, e.g. Nb(C,N). The three general relationships which controls the behaviour of N in liquid steel with respect to that of C are namely (i) N is much more soluble than C, as much as ten times higher in ferrite, (ii) the alloy nitrides are generally much less soluble than iron nitride, and (iii) the nitrides are normally more stable than the corresponding carbides. The solubility of nitrides and carbides in the steel overlap. The ability to perform controlled thermo-mechanical processing successfully depends on the total composition of the steel and the solubility of nitride- and carbide-forming elements in the hot working temperature range and below. For example, VN along with Nb and Ti carbides and N rich V(C,N) can precipitate during hot rolling and therefore help control of austenite recrystallization which is the basis for controlled rolling. On the other hand Only V carbide, which is too soluble, does not help in controlling the austenite crystallization. Ti and Zr nitrides are too insoluble, i.e., if present, they precipitate at temperatures above, or high in the hot working range, and are therefore also less useful in this regard. The highly stable nitrides do, however, help maintain finer austenite grain size during soaking, and this is beneficial to subsequent processing. The micro alloying elements used with N are frequently used in combination to take advantage of their individual effects throughout the thermo-mechanical processing temperature range. Aside from its effects in controlling austenite grain size during controlled rolling, N also contributes to precipitation strengthening in ferrite in low C micro alloyed steels, forming a nitride and/or carbonitride, depending on overall composition and processing history. It has been shown that this extra increment of N strengthening amounts to around 5 to10 MPa per 0.001 % of N. Precipitation strengthening by N occurs over a wider range than that by carbides, and this is obviously beneficial to the conduct of processing operations. Optimum precipitation of VN, for example, occurs at around 600 deg C, which is therefore the preferred coiling temperature. Detriment to impact toughness caused by precipitation strengthening is mitigated by the fact that VN apparently forms within ferrite grains rather than (as in the case of VC) on grain boundaries. Also, the loss of toughness due to precipitation is balanced by an improvement in toughness brought about by the refined grain size. Conversely, uncontrolled N can have several harmful effects in steels, typically lowering ductility and reducing formability (i.e. enhancing embrittlement, reducing notch impact strength). Re-nitrogenized stainless steels can be difficult to hot work, possibly because of a high, N induced work hardening rate and possibly because of the deleterious formation of Cr nitride particles or clusters. High N stainless steels can also present difficulties during cold forming due to strain aging. The most likely and important deleterious effects of N on forming properties occur in cold working. N contributes strongly to strain aging in flat rolled C steels, which is caused by the interaction between dissolved N and the dislocations, or crystal defects, which always exist in the steel. Besides decreasing ductility, strain aging produces non-uniform deformation during yielding (yield point elongation), leading to unsightly ‘stretcher strains’, or Lüder’s lines in deformed sheet steel. This is aggravated by any prolonged holding between final cold rolling and sheet forming. The effect can be prevented, as in the familiar non-aging steels, by fixing the otherwise dissolved N in the form of alloy nitrides of Al, V, Ti, boron (B) etc. In the case of unalloyed and therefore susceptible steels, strain aging can also be avoided by giving the steel a light rolling pass (skin pass) shortly before forming. This temporarily locks the dissolved N to dislocations. Such non aging steels have been available for many years; examples are the Al killed drawing quality (AKDQ) grades. Addition of N (and C) fixing elements in sufficient (hyper stoichiometric) concentrations produces the interstitial free (IF) steels, known for their high formability and complete freedom from strain aging. B, which has a strong affinity for N and forms a highly stable B nitride, has been used very successfully in this fashion. All steels contain some N which is effective in improving the mechanical and corrosion properties of steels if it remains in solid solution or precipitates as very fine and coherent nitrides. When N is added to austenitic steels it can simultaneously improve fatigue life, strength, work hardening rate, wear and localized corrosion resistance. N in austenitic solid solution is an enormously useful element with respect to austenite stability, corrosion resistance and mechanical properties. N along with C is responsible for the discontinuous yield point which characterizes the stress-strain curve for low C steels. The dislocation pinning responsible for this yield point also contributes to the characteristic fatigue limit of these steels. N increases the strain hardening rate and can be used in a wide range of steels, including austenitic stainless steels, to produce solution hardening. Probably the hardest and best wearing steel surfaces are produced by the absorption of N into the surface of alloy steel components, generally with insignificant distortion and thus without any need for machining subsequent to nitriding. N can also play a distinctively destructive role in the fracture toughness of structural steels. Small changes in N content produce significant variations in the fracture mode transition temperature of these steels. These variations are complicated by consequential changes in precipitated nitrides , associated changes in grain size, and the interaction between N and Mn. N can also adversely affect the way in which steels behave after plastic deformation. This process is time dependent and is known as strain ageing. N also has an important influence on the microstructure and properties of dual phase (DP) steels. It increases the hardenability of the austenite islands formed at inter critical annealing temperature by a partitioning effect of N in solution. Mn retards the diffusion of N by forming atom pairs within the iron lattice and providing low energy sites for N atoms. N has the effect of increasing the austenitic stability of stainless steels and is, as in the case of nickel (Ni), an austenite forming element. Yield strength is greatly improved when N is added to austenitic stainless steels. N in low alloy steels is undesirable due to the formation of brittle nitrides. However, the use of N in high alloy steels has an array of advantages that makes it appear interesting as an alloying element. The advantageous role of N in tool steels is connected with its action as an interstitial element in a solid solution and forming in combined state dispersion precipitates of nitrides and carbonitrides. The above-mentioned actions modify steel behaviour during melting, plastic forming and heat treatment which eventually yields more homogeneous and fine-grained structures of tool steels. As a result, there is an improvement of steel resistance to tempering, crack resistance and thermo-mechanical fatigue resistance which enhances durability of tools. Introduction of N into high-speed steels reduces the micro- and macro liquation of alloy components, which is conducive to crystallization and facilitates plastic working. .N increases the strain hardening rate and can be used in a wide range of steels, including austenitic stainless steels, to produce solution hardening. Probably the hardest and best wearing steel surfaces are produced by the absorption of N into the surface of alloy steel components, generally with insignificant distortion and thus without any need for machining subsequent to nitriding. properties of HSLA steels. These nitride precipitates may pin the grain boundaries or act as nuclei for new grains during phase transformation, thus refining ferrite grain size. Grain refinement substantially increases yield strength and also decreases the fracture mode transition temperature, The nitride precipitates also contribute to precipitation hardening and consequently increase yield strength. N forms an iron martensite similar to C, but this phenomenon has never been exploited commercially and there are no heat treatable N steels as such. N does, however, have some effects on the heat treatment of conventional structural alloy steels. It has probably a mild but positive effect on hardenability. It depresses the martensite-start (Ms) temperature. It retards formation of pro-eutectoid ferrite and bainite. N also possibly contributes to secondary hardening in V bearing steels by affecting the precipitation of V(C,N) during tempering, and in Cr-V steels by retaining a finer grain size during tempering due to the presence of alloy nitride particles. Nitriding, the intentional diffusion of N into finish-machined surfaces to produce extremely hard cases, is an important commercial process. All steels can be nitrided but the process works best if at least 1 % of alloy nitride formers, typically Cr and Al are present to help produce a fine grain size. One of the benefits of nitriding is that it can be performed at relatively low temperatures, thereby minimizing distortion. When combined with carburizing the process is known as carbonitriding or nitrocarburizing, depending on whether it is performed above or below the eutectoid temperature respectively. As an interstitial solid solution strengthener, N provides an inexpensive means to increase strength in hot rolled steels for automotive applications. N is most widely used as a micro alloying element in HSLA steels, where it contributes to grain refinement as well as precipitation hardening. Applications include sheet, strip and plate for structural applications as well as high strength, weldable reinforcing bars and some forging and cold heading grades. N has a very positive influence on creep strength and it is therefore used in steels for applications such as steam and gas turbine components and boiler tubes. N is also used to extend the passive range of austenitic stainless steels. Many alloy steels containing Cr, Mo, V, etc., as well as die steels contain N both for strengthening and because N is an austenite stabilizer. This permits the formulation of compositions with somewhat reduced Ni contents.